Phlebotomists represent a fundamental part of any healthcare practice, with blood draws being the most common invasive medical procedure conducted in U.S. hospitals. The drawing and testing of blood is also a vital link in the diagnostic chain, with laboratory results contributing to nearly 70% of all clinical decision-making. But, aside from the chance to make a real contribution to any medical practice, what are the benefits of a career as a phlebotomist? Short Training Time: Here at Northwest Career College, our Phlebotomy Course can see students graduate in as little as three months. This short training time allows our graduates to transition to their new profession, and start earning money, in a relatively short amount of time. The Employment Outlook is Positive: According to the U.S. Bureau of Labor Statistics, the employment of phlebotomists is projected to grow 25 percent from 2014 to 2024, much faster than the average for all occupations. This growing need for phlebotomists means the employment outlook is positive and job security is high. Once you graduate, our experienced Career Services team works with our graduates to help them find the best phlebotomy employment opportunities in Las Vegas. 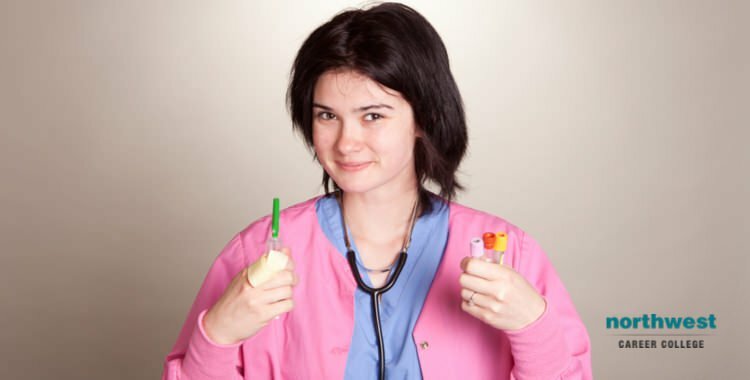 Great Potential Earnings: According to the U.S. Bureau of Labor Statistics, a phlebotomist with an RPT earns $31,630 a year, with more than half of working phlebotomists earning more than that. The top ten percent of phlebotomists can earn more than $46,850. Job Satisfaction: Phlebotomy is an excellent career for those with a desire to interact with and help a variety of people. The job role suits those with good interpersonal skills who can effectively put patients at ease during a procedure that many are uncomfortable with, and around 10% of Americans are phobic about. The ability to assist, reassure and help with the diagnosis of patients contributes to the high job satisfaction for those in the field of phlebotomy. Previous Blog: How To Improve As A Dental Administrative Assistant?Next Blog: What Are The Most Popular Types Of Massage?